1. The Vaquita is a unique, shy, beautiful porpoise who is a one of a kind. This isn't losing a regional population of a species with a broader range, vaquitas are only found in the Gulf of California. 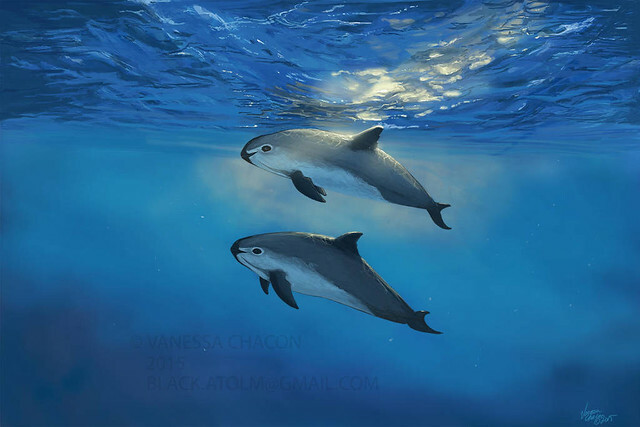 They are so shy, they were only seen by scientists in the 1970's and few pictures exist that are not of dead vaquitas (so I'm including a post of a painting). 8. Watch for the Mark Trail Comic for Sunday April 7, 2019 as it will feature the vaquita. The Mexican government said Thursday it will use buoys to mark the reserve of the world's most endangered marine mammal, in a bid to save the last remaining 10 or so vaquita marina porpoises. Couldn't say it better than Alejandro. NOT the correct response, just some sleight of hand hoping to divert the world's attention. OK, not my favorite paper NORMALLY, but I think it gets a lot of attention nationwide. Great piece on the VAQUITA there is HOPE with immediate ACTION!! Maybe this will finally get endangered species back in the national discussion. My family watched "Big Miracle" recently and the entire nation was captivated by the plight of 3 gray whales trapped in the ice. 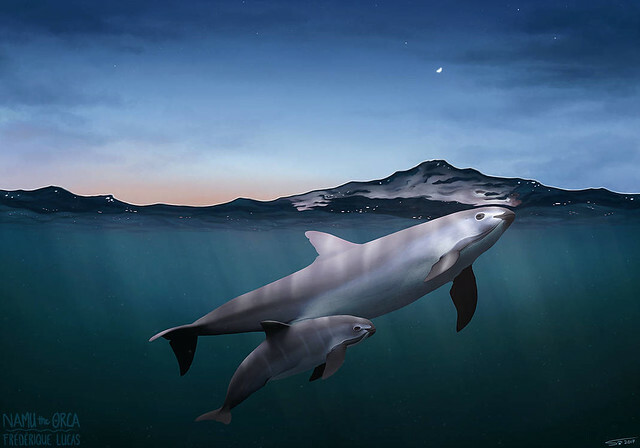 It is time the vaquita held our attention the same way. If we can't save the vaquita, no matter what our cause is, it is probably doomed. 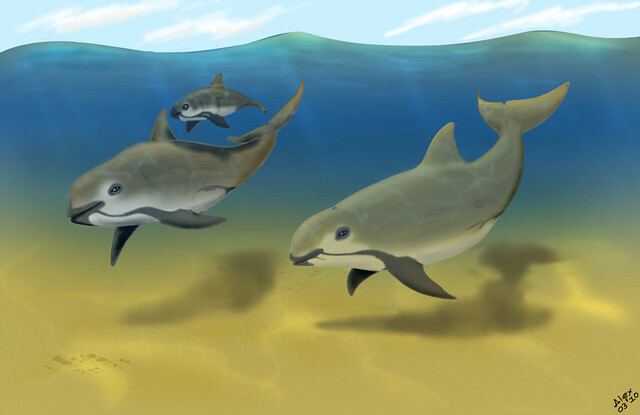 Saving the vaquita is an easy one. Small geographic area, not competing with humans, ONE reason, and easy fix. No nets, no death. A "NO GO" marine reserve would easily increase productivity in the rest of the Sea of Cortez. Sea Shepherd is the group that has stuck by this and pulled the nets. Please consider helping. This could be the last year there are vaquita without your help. Why does it matter if we save the Vaquita? OK, I get it. There are a lot of other hot issues out there. I also know that a LOT of us have disaster fatigue. I know a LOT of us don't need more bad news. So why do I post and post and post and post about the vaquita? Well first I'm falling for the little critters. But my point here is that this is a relatively small problem with very exact solutions. This isn't global warming and this isn't a Mars mission. This isn't how to make our nation more compassionate and secure. BUT, this is a chance to draw a line. This is saving one spot of beauty in a world that is falling apart around us. Again we have a beautiful animal that is dying for one reason GREED, by one method ILLEGAL POACHING, with an enemy that is located in 3 precise locations (fishing towns in the Sea of Cortez), who are only armed with ROCKS and PLASTIC NETS and they are NOT wealthy. So if we can't draw a line and pull together to save the vaquita, how are we going to fix global warming? Create a culture where racism and xenophobia are not acceptable? Promote hope and tolerance rather than hate and violence as solutions? Cooperate rather than compete? Show we can rise to a challenge rather than express our sorrow and regret (or is it thoughts and prayers)? I hope and pray they know our hearts are with them. We're desperate for them to succeed and to hear of a recovering population in the next few years. But where is the U.N.? Where is the U.S. Coast Guard? Where are the world's navies? Can't some nation somewhere send boats? Is there some other nation that Mexico trusts? The environmentalist group Sea Shepherd said Thursday that it found the body of what appeared to be a vaquita porpoise, one of perhaps only 10 that remain in the world. The group said the remains were too badly decomposed for immediate identification and had been turned over to authorities for further study. Two Sea Shepherd patrol boats found the animal in a net Tuesday in the Gulf of California, the only place the critically endangered tiny porpoises live. The group patrols the gulf, also known as the Sea of Cortez, removing illegal fishing nets. The vaquitas get caught in nets set illegally for totoaba, a fish whose swim bladder is considered a delicacy in China. In a report issued earlier this week, an international commission of experts estimated only six to 22 vaquitas remain alive. Please consider supporting Sea Shepherd. MEXICO CITY — Experts said Wednesday that only 22 vaquitas remain in the Gulf of California, where a grim, increasingly violent battle is playing out between emboldened fishermen and the last line of defense for the smallest and most endangered porpoise in the world. I'm BEGGING YOU to not ignore this article. The vaquita are beautiful, mysterious, shy. They are unique in the world. There are only a few left. Cuter than puppies, more squee than kittens. More mystery than a Murder She Wrote episode. She is the VAQUITA!!! PLEASE consider supporting Sea Shepherd. This is a last ditch effort. Bottom of the ninth with 2 outs and 2 strikes. 15th round and Rocky is getting pounded. Final 10 seconds of the 4th quarter and the other team leads by 5 with the ball on our 1 yard line. This is NOT a historic fishery. The fishermen moved into the area ONLY to exploit the Totoaba for the Chinese. Globalization fans can claim it was for the good all they want, but damn Nixon to the darkest reaches of hell. Now the Chinese have the money to destroy some of the worlds most beloved species and do it by exploiting their people in the modern version of slavery. Damn and triple damn. Also please support the Whistleblower Act. This program has ALREADY been FUNDED, but never implemented.